STATEN ISLAND — A Rosebank gallery is hosting some spooky visions this Halloween. The Alice Austen House is inviting visitors to view haunted houses from across the country in an exhibit of pictures by Corinne May Botz. 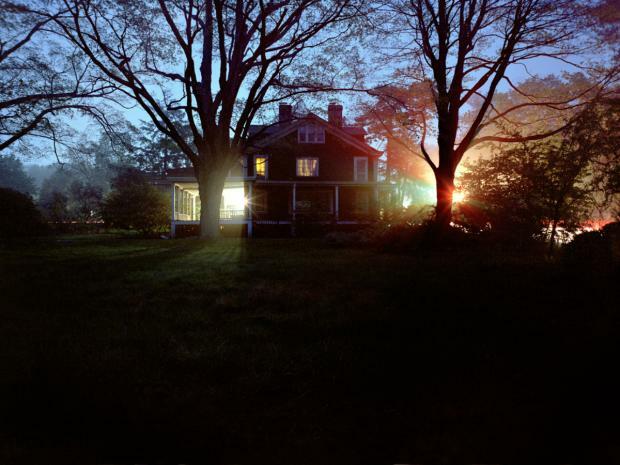 The photographer traveled extensively to document haunted homes and the people who lived there. Armed with an audio recorder and a large format camera, Botz visited homes, and talked to owners about their experiences. "A lot of people had personal experiences they could talk about," she said. "I tried go to as many places as I could. It was a really interesting way to travel and learn about different regions and histories and people." For the series, Botz shot historic homes — like Edgar Allen Poe's place in Baltimore and the Alice Austen House — as well as homes where people were currently living. "There's lots of historic houses," she said. "I also wanted to balance that with these domestic houses that these people still live in." She would find out about the places from friends, or simply from visiting communities and asking locals. She would then knock on the doors and spend some time with occupants, hearing their story before taking photos. "People were incredibly generous and open and willing to share their houses with me, and seem to like telling their ghost stories," Botz said. She worked on the series for more than 10 years, and would make it a point to visit a haunted house any time she traveled. The series culminated with a 208 page book published in 2010. Since then Botz, who lives in Brooklyn, has shown the photos in Europe and across the United States. The exhibit at the Alice Austen House is the first time it has been shown in New York. The exhibit will have 18 photos from the series, including one of Austen's old dark room, and for the first time have an audio component of the interviews Botz did. The Alice Austen House isn't the only haunted spot in the borough featured in the gallery. Botz also shot the Old Bermuda Inn in Rossville, which is allegedly haunted by a Civil War era ghost. "It's a photograph of a painting that's hanging in that restaurant," she said. "It has a very Victorian sensibility and just ties in with the context of the show." Botz got the idea for the project when she was living in an old home in Baltimore, and started to read a lot of Victorian-era ghost stories. The photographs were less about ghosts or the supernatural, and more about the lives of the people and their homes. "In a lot of my projects, I'm interested in an emotional connection people have with their homes," Botz said. "It was a way of exploring that." For the series, Botz tried to avoid over dramatizing the photos or showing proof of ghosts. She instead focused on shooting each scene using only natural light, and during different times of the day. "The main thing was using available light, so not adding my own light to it, and just responding to the space itself," she said. "I didn't want only night time pictures so it would look spooky. I didn't want to over dramatize it." After shooting more than 85 haunted houses for the series, Botz only had one paranormal experience. "In Gettysburg I did have an experience," she said. "The door opened by itself when I was photographing it." However, she said it did not make a good picture and wasn't used in the book. The "Haunted Houses" exhibit will run until December 20 at the Alice Austen House. For more information, visit the museum's website.